Having 'HD' in the title is a bit of a misnomer for this terrestrial PC TV tuner as far as UK viewers are concerned as, while it's capable of receiving H.264 HD broadcasts (as used in parts of Europe), it can't be used to receive Freeview HD's DVB-T2 transmissions. What it does give you is SD Freeview channels, analogue terrestrial TV and FM radio broadcasts. You can also capture video from external sources, which is welcome if you have cherished video footage that needs archiving or want to use it to record from a receiver. Size-wise, the Volar HD compares with some of the bulkier flash drives on the market and sports a red power light. Also in the box is a two-pronged portable high-gain antenna that can be attached to your laptop using a sticky pad. However, we failed to get channels using it and found ourselves relying on our rooftop aerial instead. An additional antenna caters for radio reception. A lead is supplied for external capturing with S-video, composite and stereo phono connectors. If you want to record from a Scart output you'll need an adapter (sadly not included here). The stubby, angular remote is very basic, though it has clearly labelled buttons and the tuner proves responsive from a distance. No remote eye is included, however, should you wish to tuck your PC out of sight. 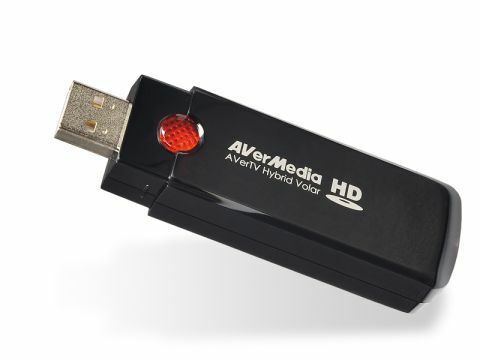 The tuner will work in conjunction with Media Center running on Windows 7, Vista or XP, or you can use Avermedia's own AverTV 6 (included), which offers viewing, recording and timeshifting. Tuning of TV and radio is handled in a separate setup menu while the main interface comes in a choice of two skins – 'Azure Fantasy', resembling a fancy car radio, or 'Dusk Comet', which looks very sci-fi but has a circular layout that takes some getting used to. Good use is made (in the former especially) of easy-to-identify icons for intuitive navigation. Video playback is handled in a separate window that can be blown up to full screen, overlaid, viewed in 4:3 or 16:9 or shown in a choice of resolutions up to 720 x 576. The EPG supports DVB data viewable in two ways – as a side-scrolling grid of data for seven channels at once extending 12 hours ahead, or a list of what's coming up for the next seven days for one channel at a time. Synopses are included and recordings can be scheduled. Recording timers can be set for internal tuners (including radio) and external sources with once, weekly and everyday repeat options. You can have the software record silently in the background, and bring your computer out of standby or hibernate mode to record. Available recording formats are native MPEG-2 or MPEG-4, H.264 or 'iPod' for Apple devices. As this is a 'hybrid' product you can only record from one source (and one channel) at a time. Timeshifting takes place after you press pause. A slider can be used to jump to a desired point and timeshifted TV can be saved as a permanent recording. Other trickplay features include a picture-in-picture option, so you can keep an eye on a live channel while watching a recording, and a 16-channel mosaic option. Support for MHEG-5 red button services is touted but this failed to work for us (analogue teletext did). We tested the Volar HD using a modestly specified PC with a Pentium 4 2.8GHz processor and 2GB of RAM. Playback, recording and timeshifting was handled smoothly and pictures looked solid across the board. Captured video inevitably looks soft using the composite option, but better with the S-video.